For fancy dress parties this New Years Eve’s, look no further than at Vegaoo.co.uk, UK’s largest provider of fancy dress costumes, accessories and decorations. If you are hosting a fancy dress party, find new year’s eve decorations to create a special and colourful party! Decorate the party with fun party decorations to see in the new year with a bang! Choose photo props, glitter balls, glow sticks and bunting to add cheer to the room. For the buffet, new year’s eve table decorations include plates, glasses and cutlery from matching themes, colours and designs! Throw the best party to start the new year, as you count down to midnight, supply the party with fun party poppers, confetti cannons and balloons. Your friends will never forget the brilliant party and new year’s decorations. Choose a silver theme to celebrate the coming year, hang silver metal lanterns from the lights, place silver banners on the doors and stick silver stickers on the windows! Your friends will love taking photographs with the festive photobooth kit, funny moustaches and mini hats to make everybody laugh. Ensure nobody is left out with a party favour kit for 10 people, the ultimate new year's eve decorations, with hats, ribbons, balloons and blowguns! Do you have a costume in mind for your friend’s fancy dress party this New Year’s Eve? Find inspiration at Vegaoo.co.uk and enjoy searching for the perfect costume. Find new year’s eve fancy dress ideas on our site! You are sure to find a cheap costume with all the quality you expect. Discover many different themes and ideas for men, women and children! New year’s eve fancy dress has never had such a variety, pick a cowboy, doctor, medieval, scary, humorous, disco costume.. the list continues! Follow our top new year fancy dress ideas and themes to dance the night away. Choose a disco costume for men, a Charleston costume for women or a funny carry me costume. Couples can also match with our large range of new year’s eve couples costumes. If you have chosen your costume, you may require a new year’s hat, something fun and colourful to stand out from the crowd. Try a sequin hat to brighten up the dance floor or a top hat to add style. 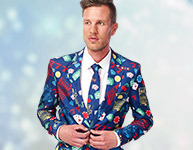 Have fun buying your new year’s eve fancy dress at Vegaoo.co.uk! Everything you need on one site for your new year's eve decorations and new years fancy dress. Explore our top themes and essentials selection to find new year's eve fancy dress ideas for you and all the family! Choose matching couples costumes or an original costume to make all your friends laugh. Make this New Year's Eve the best yet with a party like no other! Let Vegaoo.co.uk inspire and supply your party with the perfect elements to create a special countdown!